Tennis Balls can Injure Dogs - Why I Hate Them - and Why Dog's Love Them! For many dogs, the highlight of their day is a game of fetch with the ball. Who can resist? You’d have to have a heart like a stone to say no. Or, like me, to know too much. Stay with me while I show you five ways that tennis balls were made in the devil’s workshop. Afterwards, I’ll tell you how your dog can still have that fun without the risk. Tennis Balls Injure DogsDogs are dogs, not cats. You probably didn’t need this vital piece of news, but many dog owners really do exercise their dogs like cats (some also feed their dogs like cats, but that story’s elsewhere!). What do I mean? Think about how wolves hunt: they chase their prey over long distances, tiring them out until they can bring them down easily. In other words, just like humans, dogs are built to be endurance athletes. What dogs aren’t are natural gymnasts. Although they can easily outrun a cat over a long distance they aren’t as good at leaping, twisting or climbing. They lack the explosive spring and the natural flexibility of cats, who hunt by stealth. In modern exercise terms, cats are fast twitch, dogs are slow twitch. When dogs chase tennis balls they suffer a lot of joint injuries. You’ve only got to look at the way dogs twist and jump, skid and turn to see why. Injuries like a fragmented coronoid process in a puppy can lead to permanent damage, whereas older dogs commonly have chronic carpal (wrist) sprains. Tennis Balls Cause Heat StrokeThat’s not the worst thing. 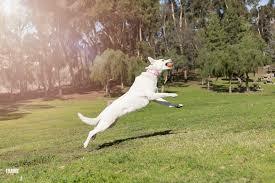 The most common cause of collapse from heat exhaustion in dogs is playing fetch in the warm weather. It doesn’t even have to be that warm for dogs to overheat with vigorous exercise. Dogs have been selected for thousands of years to work hard for humans, and they won’t suddenly stop now. The responsibility is with us to be their guardians. I made the mistake with Loki of playing with tennis balls when he was young. Who can resist it when it’s so much fun for the dog? The problem is, it’s so much fun that all the other fun stops. For many dogs, they get so obsessed that when there’s a tennis ball around, nothing else matters. They even stop playing or socialising with other dogs. ​This happens mostly with working breeds that are by nature a little fixated, like Border Collies, Cattle Dogs (Heelers), Kelpies and yes, Jack Russell Terriers. Loki wouldn’t even eat or go for a walk, let alone come for a pat, if he knew where one was. Great if you want a good ratter, not so good if you want a happy dog. ​Then there’s the dental problem. Something about the fibrous coating of tennis balls causes persistent wear on the teeth, producing the characteristic flattened crowns shown. This effect is so reliable that when I see it I can predict with 100% accuracy that tennis balls are being chewed. Remarkably, this never happens with dogs that just chew bones. With time, the tooth wear eventually exposes the root canal, causing pain, apical abscessation and tooth death. Tennis Balls Cause ObstructionsIf you’re like me you’ll find this video strangely compelling. It shows endoscopic removal of tennis ball fragments from the stomach of a dog. If these weren’t removed now, they probably would have gone on to block the intestine and cause a surgical emergency. Tennis balls just aren’t up to the forces dogs create when they chew. Better to stick to these safer chew toys designed for dogs. So spoilsport Andrew is saying that you shouldn’t play fetch with your dog and all fun is forbidden. Instead, here are some ways you can keep playing fetch games without doing so much damage. Try playing fetch with objects that go ‘plop’ instead of ‘bounce’, like special Frisbees made for dogs or rubber sticks (never use real sticks). Moderation is the key. Keep high impact activity down to 10 minutes a day, and have a clear ‘finish’ signal so your dog knows not to keep looking for more. Don’t play energetic games in hot weather, or when your dog is injured. They’ll keep going as long as you ask them to, to their own detriment. Use other balls, but if you must use tennis balls, don’t leave them out at home so your dog can’t chew on them or swallow them. Sometimes, just like when giving treats to dogs, you have to know when enough is enough. My Loki loves balls so much that we had to stop them completely just so he could live a normal life. Let’s just say that since then, no one ever says “what an unhappy dog”. ”My dog stressed??!! … Never, they live in paradise, they have fallen with their little butts in butter, they live in absolute luxury.” It is phrases we hear often, but dogs are more part of our household and social activities than ever before and we unwittingly place more and more demands on them, without teaching them how to cope and adapt. Separation Anxiety is one of the worst behaviour problems there is. Unfortunately, this wont go away by itself, the condition will just get worse, often with other behaviours developing as well. The sooner you get help for this condition, the better. Intelligent disobedience, also known as ‘selective disobedience’ is observed when a service animal willingly disobeys the owner’s instructions because it isn’t safe to do so - how amazing are our dogs!